Play semi-finals and a final - this should make it less likely (though not impossible) that teams reach the final when perhaps their earlier performance didn't merit it. Use international umpires as is customary in bilateral tournaments in this sport. The standard in this latest competition has been particularly poor in some games and therefore some teams have been badly disadvantaged while others have not. There will always be some variation but it has been more marked this time than I can ever recall it. Do not play day/night matches in situations where the team batting first has such a huge advantage that they have to throw the match away rather than win it. * Despite a number of emails from followers of this World Cup, no one has been able to explain why ALL points from the group stages are not carried forward into the 6s. I have also not heard any explanation from the experts on TV commentary. If a system is in place which no one understands, should it be there? And anyway to exclude the matches from the initial group against the sides eliminated seems to be to be rather insulting. It is suggesting to those sides that they might as well have stayed at home as they made no contribution to the Cup. If that were really true then you shouldn't have asked them in the first place! ** NRR is presumably supposed to encourage teams to win as swiftly as possible, or obtain as convincing a win as possible, but scenarios easily arise when it would pay a team to do exactly the opposite and that is hardly in the interests of providing an exciting spectator sport. You could hardly blame a team who took advantage of this. The same problem may arise with the 'no points carried forward' situation above. Yes - I know that you could throw a match to ensure you'd meet the team you'd rather face in the next round, but I think this scenario is rather less likely. I typed the above immediately following the end of the Word Cup 2012/13. However, it would seem others have given rather more thought to this problem than I have. I have received a pdf from Chris Langman which has given me much food for thought. He sets out a number of principles he feels any set of rules should follow and then outlines a format which complies with them and gives rise to no more matches than were used in the recent tournament. It is, in my opinion, an inspired piece of work, and I recommend you read it! What he has come up with is revolutionary. If you have any thoughts on his ideas then do email me and I will pass them on. I have had some follow-up after the release of Chris' ideas. I have just read the piece from Chris Langman on alternate rules for WC. You will not be surprised to hear that I think they are excellent - not just because they put England (retrospectively) in the final! They make perfect sense to me and the points are along exactly the same lines as the ones I suggested to you....trying to ensure that it is far less likely that 2 teams end on the same points and rewarding teams for getting close! The only thing I do take issue with is not including the head-to-head game as a tie-breaker. Whilst I realise that using it breaks one of his rules, it is a fairer/better/more understandable way of splitting teams than number of wickets or PRR or bowling at stumps. The very nature of sport is AvB and a win for one should count for more than wickets taken across the tournament for example. That could be dependent on conditions, the ground you get to play at, etc....head to head is more relevant and fair to both teams - same day, same (ish) conditions, same ground, etc. Otherwise it is excellent. I am a fan of a win the toss in advance scenario. I like the idea that in a 5 match series you toss once before the 1st game and then alternate...it just seems fairer (although picking a team becomes a different exercise I guess when you already know if you will be bowling first/second). Why even bother having opening Group Matches and the Super Six round? Only 8 teams are in the competition, so put them all in the one group and everyone plays everyone else. That would only add on one extra match for each team and make the whole tournament fair and equitable for all. If two teams are tied on points at the end then the team who won the match between them both finishes higher; if more than two teams tie on points then bring in Net Run Rate. Then either have the top 2 teams play the final, or the top 4 play semis-finals, depending on choice. Yes, if the team who wins the group stage doesn't win the final it might seem unfair, but who would run a World Cup without a final? The season kicks off (sorry) this weekend with the first round of the County Championship. While the top teams hope this season the weather will treat us more kindly, a few new changes to the rules, especially with regard to the re-organising of washed-out fixtures, may make things a little fairer. We'll have to wait and see. It will be a strange year in at least one respect with the Championship matches, except for the final, all over before the summer is half done. Why this is so I cannot say but I would not like the job of fitting in all the fixtures, county, super 4s, internationals, EWDP etc that those in authority have to struggle with, not to mention a nod to the non-ECB events organised by the Lady Taverners and others. At Sussex we have surprisingly little travelling to contend with for which we should perhaps be thankful, but as you may know I prefer the home and away competition. Is the fact we have more teams in each division than we did a year or two ago the right way ahead? I feel it's still too early to say and I have perhaps been too hasty in wishing to meet the top teams more often. For the sport as a whole, will it encourage those at the foot of each division when they play sides further removed from their level and encourage them to fight to improve? One hopes it will. Maybe by about 2016 I'll have made my mind up! Meantime I can at last spend a day (I hope!) watching five England internationals and, who knows, some future ones in combat at East Grinstead CC. One aspect of this tournament that could be improved I feel is by playing matches in more public places. So often they are tucked away where few if any spectators will be watching a women's game for the first time. Charlotte Edwards and others spend much time and many car-miles around the country trying to encourage youngsters to take up the sport, but county teams seem reluctant to play in public parks (and yes some do have adequate facilities and fine pitches) which would surely do more to increase public awareness that women play cricket. Internationals, especially those that are televised (sadly far too often only T20s) do increase the sport's profile but I have seen how an admittedly small crowd can build up to watch at least part of a game if you play where passers-by spot what's going on. More than once I have heard "Is that a girl playing out there?" "Can't be - or they must be short of players!". "I think they're all girls". And then the speakers stop to watch for a while. Variations on this conversation always make me smile, and I find myself thinking that at least some have been disabused of the idea cricket is only for men and boys. Tucked away in the country at a small club ground, the sport sometimes feels more like a private function, and that's not the way to find the next generation of players or followers of the sport, who might turn into helpers in one form or another. is located between the shops and a major car park. 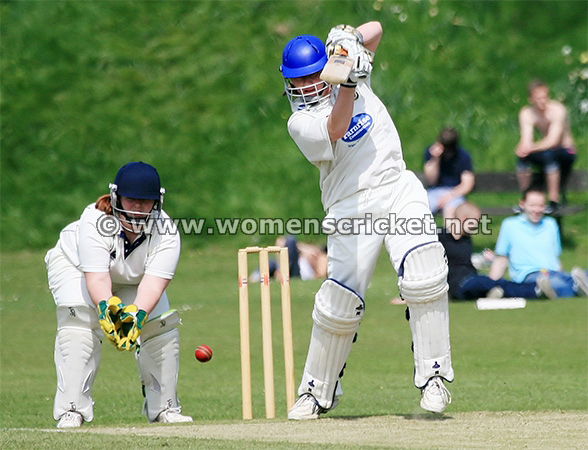 The batsman is Sussex's Sara Lord batting in a friendly against Hampshire in 2010.